Trademarked terms can become so well-known that they become regular words; if you call a vacuum flask a thermos, or a hookless fastener a zipper, you’re using a genericized trademark. Trademarks that become generic can no longer be legally enforced, so trademark holders will fiercely defend their trademark once it starts being used generically. Etsy sellers are often taken aback when their use of “common” words get them in trouble for violating a trademark. Since these trademarks are in danger of becoming generic, the trademark holders are dead serious about roasting anyone misusing them. Etsy will remove items when served with DMCA notices, and even shut down your shop for repeated violations. The best way to protect yourself is to learn about trademarked terms so you don’t end up in hot water. 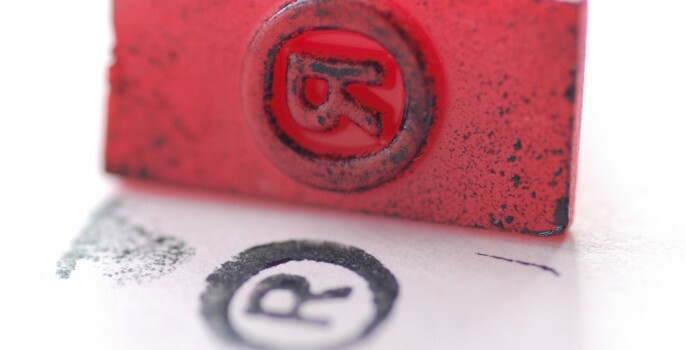 Here’s my list of the top 9 trademarks that are commonly misused on Etsy. The use of this o-word is so widespread that many sellers don’t know the generic term (it’s infant bodysuit). Gerber owns the trademark to the term Onesies and aggressively defends it from misuse. Some sellers try to sneak one past Gerber by using variations like “onesie” or “onezees” and end up in the roaster nonetheless. Sellers using true Gerber-brand Onesies are free to use the term. If that’s not appealing, learn to love the bodysuit. Gerber has good reason to protect the trademark – I’ve ordered screen-printed bodysuits that were low-quality materials and disappointing. That’s not the association you want with your brand. Lip balm hasn’t been the same since this famous stick came along. The Chapstick trademark is now owned by Pfizer and is certainly the easiest to mistakenly abuse among bath and body products. There’s also a niche market on Etsy for Chapstick accessories – necklaces and keychains to hold tubes of the famous product, designed for those with a true lip balm addiction. The accessories may be photographed with a Chapstick-brand lip balm peeking out, but that doesn’t stop them from violating the Chapstick trademark. With the rise of HGTV and interior design shows, the term “shabby chic” has entered common use to describe a decorating style using time-worn furnishings and fabrics. Rachel Ashwell is not too happy about it; she literally wrote the book on shabby chic, after more than a decade owning stores and product lines featuring the trademarked name. Etsy confounded the situation years ago by including “Shabby Chic” as a style option when listing items. They have since changed it to “Cottage Chic” – and many sellers have been using “shabby elegance” in place of the famous trademark. Rachel has been taking down listings on Etsy and eBay for years, so tread lightly when describing your housewares. Taggies blankets have become a hot commodity for expecting and new parents; the blankets have fabric tabs sticking out on all sides that babies love to play with. It seems like a simple concept, but this one is a doubly protected. The terms Taggie and Taggies are trademarked, and the company has a patent for the actual concept of looping tags or ribbon between two fabric sheets. Many sellers use “tag blanket” or “sensory blanket” as titles to avoid the trademark, yet are still infringing on the patent. It’s best to reconsider making these blankets in the first place – or if you do, come up with a novel new idea for engaging the tot’s sense of touch. The Danish company Pandora debuted a charm bracelet in 2000 with a unique system of keepers to preventing the bunching of charms. So unique, in fact, that Pandora secured a patent for the bracelet. The craftsmanship and variety of Pandora’s interchangeable charms has landed them in the big time, and counterfeit bracelets have started coming out of the woodwork. Pandora has begun to aggressively defend its patented design and the company trademark related to jewelry. There’s nothing sacred about charm bracelets, but using Pandora in a title, description or tags will land you in hot water. The sparkle and delicate cuts of lead glass beads has made them desirable since the technique was discovered in the 1600s. The Swarovski company improved on the technology, first patenting a glass-cutting machine that facilitated the production of lead glass “crystals” and then creating metallic chemical coatings to enhance their appearance. The authorized mention of the trademark makes it clear that you’re the maker of the item, not Swarovski themselves. The phrase “Who dat” came out of New Orleans and more recently has been a chant of support for the New Orleans Saints football team. Fans will quickly recognize the signature phrase, but Etsy sellers should forget they ever heard it. After some controversy about ownership of the trademark, the NFL settled out of court with Who Dat, Inc. The company has now been vigorously pursuing cease and desist orders against t-shirt shops and online sellers. It may not surprise you that the name Tiffany is trademarked by Tiffany & Co – but did you know the color itself is trademarked? The robin egg blue color first used on their annual catalog, now commonly associated with the jewelry company, is one of the few colors protected by trademark law in the U.S. Fiskar’s orange and UPS brown are other examples of color trademarks. Tread lightly when making jewelry at all with shades of robin egg blue, and resist temptation to name or tag the item with Tiffany or Tiffany Blue. Quatrefoil as a word and artistic concept has been around for a long time. David Yurman has ruffled some feathers by trademarking the term when used in combination with fine jewelry or precious stones. The Quatrefoil collection is distinctive, for sure, but some sellers are appalled at being able to copyright a descriptive word. The law does allow trademarking of common words – otherwise companies like Apple, Shell and Time magazine might have a bit of trouble fending off imitators. Since eBay and Etsy sellers have already had their listings removed for using this trademark on jewelry, it’s a safer bet to use the more generic term of clover. The world of litigation can hit hard and fast on unsuspecting sellers. Etsy is legally obligated to respond swiftly to DMCA takedown notices – they will shut down listings and shops for tags as well as titles and descriptions. Keep your online shop humming along by steering clear of these and other trademarked terms. Did any of the terms on this list catch you by surprise? Cover image by Marina Noordegraaf on Flickr. Thompson Enamels has a light blue they call “Robin Egg” & I use that term for the color on my website. Now I am concerned about this! What do you think? Loved this post BTW. Robin egg blue is the name of a color that is often used in place of Tiffany Blue. The later is trademarked but you are safe to use robin egg blue in your listings. Thanks for visiting! Thank you for this informative article, who would’ve guessed with some of these terms? They seem to be so incorporated into our everyday lingo! Which brings me to my question. In relation to glass beads, does “Czech” as in Czech glass beads also have a legal protection? We use a lot of Czech glass beads with our Celtic jewelry and I include the term all the time in describing the pieces. Great question, Violet! The “Czech” refers to the Czech Republic, famous for its long tradition of high-quality glass workmanship. This would be considered an appellation of origin or geographical indication, which can be protected similar to a trademark (Idaho potatoes and Vidalia onions fall under this category). This is used legally to prevent companies from using the geographical indication on products not produced in the region, rather than protection against genericization. There’s also no registered geographical indication for Czech glass beads. In short – no need to worry about this term! I had no idea about the Shabby Chi@ was a trademarked name….very good to know. I’m going to go double check all of my etsy listings! I just recently started following you, and love how informative your posts are. Thank you!! another very helpful article, Brittany. I had heard about a few of these but not all! Fascinating! Can anyone add to this list here? No need for the stories, just the trademark? I’m eager to hear about others, Kelly! “Country Girl” and “Country boy” as I have found out today! Do not use these phrases, they are registered trademarks.